When Jake's sister-in-law calls and reports her best friend missing, it's up to Jake to find her and bring her home. But Addison isn't lost, and she sure as hell isn't going to be told what to do by an ornery mountain man with whom she'd spent one torrid weekend after her best friend's wedding. Jake has never left anyone behind - will Addison be his first failed rescue? What do you do when you want to bang your sister-in-law's best friend? You have two options: forget about it or go for it. Jake tried to go for it on multiple occasions but Addy shot him down because she didn't want commitment and he was her best friend's brother-in-law. However, at the wedding reception, all bets were off. They agreed to one night, no strings. So how did that work out? Yeah, exactly. Not as planned. When does it ever work out as planned? Watching them up on the mountain was comical. But I think the best part was at the end of the book with their surprise announcement. You'll have to read/listen to know what it is. I previously read this book. I just listened to the audiobook. Wow it is just as good. The narration of BJ Harrison is amazing. I truly enjoy listening to him. 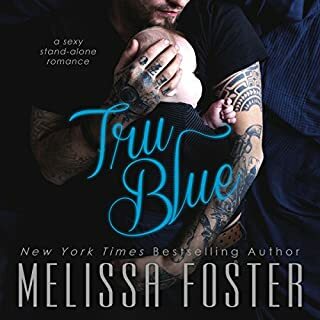 Melissa is an amazing author and she never disappoints. Jake and Addy set my device on fire. Addy is a strong woman and Jake is a very confident man. Together they have such banter and OMG the heat is sizzling. I listened to the audio version of this book. 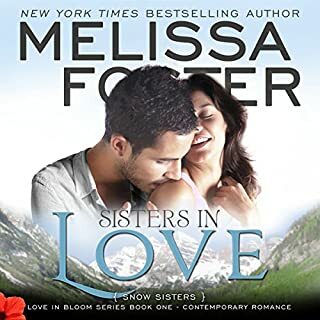 I have listened to MANY of Melissa Foster's books. I found myself having a surprisingly difficult time getting into this book. I'm still not sure why. Addy was a pretty strong character who was determined to do things on her own, in her business and when she took off on a hiking trip by herself. Jake was definitely an alpha who wanted to protect her, but was smart enough to step back when her independence came to light. He is a rescue professional, so that was a hard thing for him to deal with, but he did it for her sake. That should have made me fall in love with him--I love strong, protective heroes. I would have liked more conflict in the story and maybe some strong subplots. I still really can't say why I didn't connect to this story, but I just didn't. I also think maybe there have been so many narrated by B.J. Harrison, that they all sound exactly the same at this point. 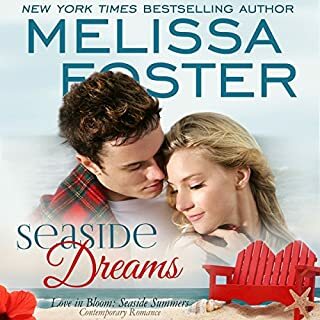 I so enjoyed Rescued by Love by Melissa Foster. Jake and Addy are the featured couple in this book with cameo appearances by other characters that I have grown to love. The chemistry is awesome. BJ Harrison does a fantastic performance with this book. One can feel the emotions he conveys. I enjoy it when an author is able to bring together two independent and stubborn people. I could hear the sparks flying! This book is part of a series and a standalone listen. When Jake and Addy meet, they are immediately attracted to each other. Addy is a strong independent woman determined to do things her way. Jake who is part of a search and rescue team, is determine to break down Addy's walls to get to the real her. At her best friend and Jake's brothers wedding, they decided to stop fighting the attraction and agree to spend the weekend together. Addy is determined to go on a 10 day camping trip alone to find her true self but all her thoughts return to Jake. After a few days of not hearing from Addy, Gabriella asks Jake to go into the mountains to find her. Once Jake proclaims his love for Addy, she finally allows herself to let go and tells Jake she's in love with too. Their chemistry makes this a wonderful story. Narrator is pretty good. What an amazing narrator… BJ Harrison is wonderful. He has a great cadence in his voice, a perfect tone, and wonderful feelings with his words. He tells that story of Addison and Jake perfectly. He takes Melissa Foster’s words and makes them come to life. While listening to the story I feel the characters come to life, their stories become realistic, and leave me wanting for so much more. Addison and Jake are one night stand pros, no feelings involved, no worries about the next day. That is until they hook up together. After circling each other with innuendos for months it finally happens and it is more than they ever expect. The “rules” are broken and everything changes for them. I am not big on one night stands but it seems to work for them. I enjoyed the circling of these two and it was impossible not to feel the sparks between the two of them well before they hooked up. The heat and attraction was amazing, maybe one of the hottest that Melissa Foster has ever written. Once again, the family and friendships are amazing. They are still my favorite parts of the Love in Bloom series. They are real and true. They support, love, and accept each other without question. Addy is one tough chick! Jake and Addy have been flirting for months but will the romance of Elpitha Island and the wedding they are attending (her best friend and his brother) cause them to finally act on their fantasies? In Rescued by Love, Jake and Addy both battle their minds while they determine if this relationship can be taken any further. Additionally, Jake has to learn how to handle the awesomely independent and fierce Addy. Watch as Jake learns that the one thing he wants to do, take care of Addy as she prepares for her 10 day camping trip and go with her, is the one thing he cannot. Jake and Addy learn to break down each others walls and possibly figure out they are better together then separate. You will love when Addy "yells" at Jake on the mountain - it is perfect Addy and such a great way to showcase their relationship. Love the narration by BJ Harrison, he breathes life into the words on the page and I felt like I was on the mountain with Addy. Awesome work! This is a great addition to the Ryder brothers and an opportunity to hear updates on some of your other favorite Love in Bloom family members. 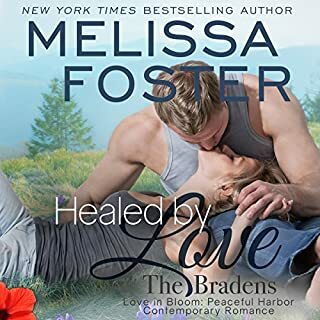 Rescued by Love by Melissa Foster was a great read. This is the fourth book in The Ryder’s series. Addison has returned to Elpitha Island for Gabriella’s wedding. Jake and Addison decide to give into their urges and spend the weekend together. I absolutely loved reading Addison and Jakes story. I can’t wait to read more Ryder’s stories. Rescued by Love is book 4 in the Ryders Series. All of these books can be read as standalones. I’ve read some of them out of order, and they do give some hints of previous books but not enough to spoil it for me. Addy was raised with every advantage and had everything done for her. She now seems to want to do everything in her power to assert and prove her independence. This means never relying on a man for anything including her happiness. Jake Ryder is completely blindsided by his feelings for Addy. He has never had time for or been interested in anything more than a superficial relationship with a woman. Jake ends up coming on a bit too strong, causing Addy to label him a “Neanderthal”! I love listening to this series on audiobook. The narrator is a really good storyteller and his narration definitely adds to my enjoyment. Jake and Addy's story starts at Duke and Gabriella's wedding, which also gives us the opportunity to catch up with the Ryders and their families. Jake and Addy meet again at the wedding of Jakes brother Duke, and they struggle to resit the fire between them. They have both been players in the past, but like his brothers and sister Jake falls hard and fast for Addy, however she is a strong, independent lady and does not want a relationship like her mother and grandmother, so has build some rather large walls around her heart. After their connection at the wedding, Jake is keen to see more of Addy but she is set for a 10 day solo trip up the mountain to find herself, only she discovers she has a rather large piece missing. As usual, Melissa has written a beautiful story, and B J Harrison narrates wonderfully, and it has you completely involved from the first page to the last. I was eagerly waiting for this book having had a glimpse of them in Dukes book, and listening to the story was just as wonderful as reading it. It also meant I could enjoy it again, while on the daily commute :) Now to listen to Gage and Sally's story.